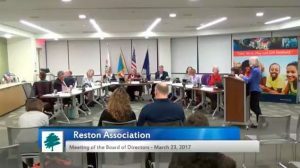 Thirteen Restonians are vying for four seats on Reston Association’s Board of Directors in this year’s election. The nine-member board is up for a major shake-up this year. Eleven candidates are running for three at-large board seats and two candidates are running for the South lakes District seat for a three-year term. Tammi Petrine is challenging Julie Bitzer for the South Lakes District seat. Voting opens on March 5. Results will be announced on April 10. The nine-member board consists of eight directors, who are elected for three-year, staggered terms by members, and one director elected by apartment owners. Four of the eight directors are district-level representatives while others are elected by the membership at-large. Reston Now will publish candidate profiles in the coming weeks. Submitted candidate statements are available on RA’s website. Candidates are listed in alphabetized form. For more information, email the elections committee at [email protected] or call 703-435-6530. Information is also available on RA’s website, including an elections calendar.